by criticizing Google for alleged skewing of search results in favor of left-wing media organizations, after watching a related Fox News segment that cited deeply flawed study results. “I won’t comment on the breaking up, of whether it’s that or Amazon or Facebook,” Trump said, replying to a question on whether tech companies like Facebook and Google should be regulated and potentially broken up by the US government. “As you know, many people think it is a very antitrust situation, the three of them. 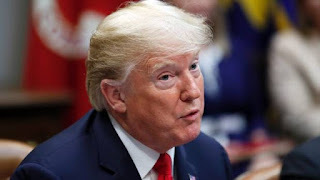 But I just, I won’t comment on that.” Trump reiterated his claim that “conservatives have been treated very unfairly” by Google. “I tell you there are some moments where we say, ’Wow that really is bad, what they’re doing,’” he added. It is not clear why Amazon is included in this latest round of criticism, as it does not operate a communications platform, but it’s likely because Trump personally dislikes Amazon CEO Jeff Bezos and The Washington Post, which Bezos owns, and has criticized Amazon frequently in the past over apparent tax issues. Trump’s attacks on tech companies have reached new heights this week and represent a growing strategy among right-wing politicians and media figures designed to paint Silicon Valley as an enemy of conservative speech. Facebook and Twitter have long been targeted by conservatives for perceived liberal bias regarding how they moderate their platforms, with Facebook having come under fire two years ago for alleged censoring of right-wing news sources in its Trending Topics feature, which has since been removed from the site. Since then, Facebook has often been accused of censoring conservatives on its platform, though any concrete evidence on the practice remains virtually nonexistent and Congressional hearings on the subject tend to illustrate how profoundly misunderstood Facebook is by most politicians. Still, earlier this week, it was revealed that a small group of Facebook employees has come out in opposition to what it sees as systemic liberal bias within the company at a cultural level, with The New York Times reporting that the group of around 100 employees is calling for more idealogical diversity. There is no available evidence that the political makeup of Facebook employees has any concrete effect on its products whatsoever, although the existence of the right-wing group within the company is sure to complicate the optics of the situation in Washington. Twitter has more recently come under fire for its alleged shadow banning of right-wing public figures on the platform, a misleading use of the term that has nonetheless helped craft a narrative of liberal bias within the San Francisco-based social network. CEO Jack Dorsey has spent the past year trying to craft better moderation strategies to deal with hate speech and other unsavory actions on his platform. Yet he’s found himself often placating conservatives and waltzing into endless controversies around whether accounts like those of conspiracy theorist Alex Jones and his Infowars network get to stay on the platform. Google, on the other hand, has remained relatively off the radar for Trump and other big-name conservatives — excluding the James Damore situation — until this week, even as the company has faced legitimate antitrust probes both in the US and Europe. In July, the European Union slapped Google with an unprecedented $5 billion fine for Android antitrust violations related to the promotion of its own software services in Google Search. It’s unlikely Google will face anything close to that level of punishment or scrutiny here in the US, where corporate oversight is much more lax and tends to follow the tides of partisan political discourse. However, following Trump’s claims of search result bias, Sen. Orrin Hatch (R-UT) has asked the Federal Trade Commission to conduct a formal investigation into any potential anti-competitive effects in Google’s search and digital advertising practices. On Wednesday, Trump posted a video of unknown origin to his Twitter account claiming Google purposefully decided not to link to his State of the Union (SOTU) address. Google denied the allegation and provided proof and an explanation as to why Trump’s SOTU address in 2017 was not linked on the Google homepage. Nonetheless, the video did its job of increasing the perception of Google as an enemy of conservatives, and Trump supporters even showed up at the company’s Mountain View, California headquarters this afternoon to protest.